One of my favourite things…Podcasts. Whats not to love, right? So i stopped for some time listening to Podcasts. I was doing some traveling, not that that’s much of an excuse, its not. I had a break from many things in fact, hey i was on holiday! Holiday is over and like Yoga is the practice of going back to it, i went back to Podcasts, how could i stay away? a digital audio file made available on the Internet for downloading to a computer or portable media player, typically available as a series, new installments of which can be received by subscribers automatically. You can start and finish your day with an interesting story, who doesn’t like bedtime stories? You start to wonder how you know stuff, how you get ideas, and then you find yourself saying…it was in a podcast!! Ronan started his career in Software Testing, he worked for free and hung out in Radio Stations at every chance he got. 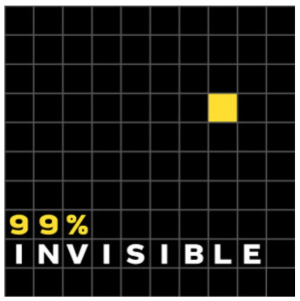 A couple of years ago he started 99 percent invisible, a project about unseen design work that shapes our lives, a project about cementing for others an infrastructure for the most creative and interesting storytelling programs to find an audience and prosper. Question is, how do you want to start or end your days?